MCA Santa Barbara is organizing a one-person exhibition by New York-based artist Dasha Shishkin. Presenting new work specifically for MCA Santa Barbara, Shishkin is known for her large, colorful drawings on semi-transparent mylar surfaces, which utilize a variety of media including acrylic, ink, and Conté. While her artwork is figurative in nature, evoking fable-like qualities, the artist eschews any concrete narrative. 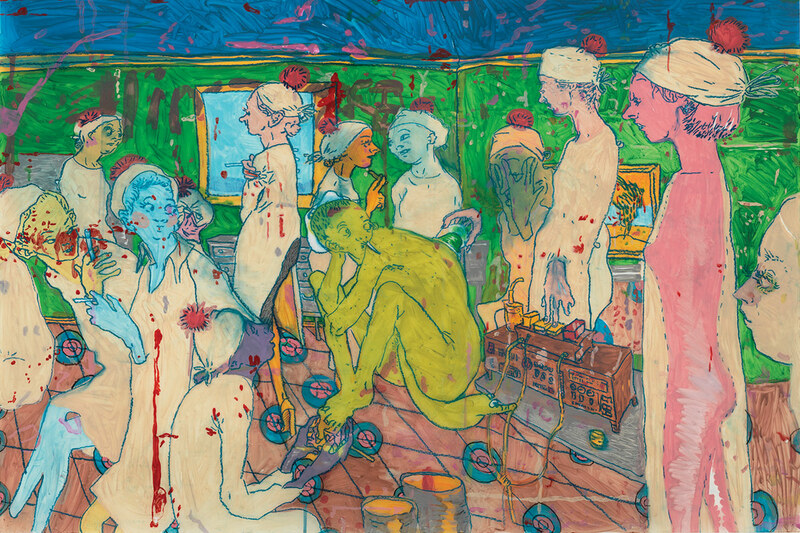 Rather, her complex compositions broadly contemplate themes of romance, eroticism, humor, and the grotesque. Born in Moscow, Russia, Dasha Shishkin currently lives and works in New York, NY. She received her MFA from Columbia University, New York, NY (2006) and her BFA from the New School for Social Research, New York, NY (2001). Shishkin has recently shown in solo exhibitions at Susanne Vielmetter Los Angeles Projects, CA; Contemporary Arts Center, Cincinnati, OH; Zach Feuer Gallery, New York, NY; and group exhibitions at Oakland University Art Gallery, Rochester, MI; Joe Sheftel Gallery, New York, NY; and Denver Art Museum, CO. She is represented by Zach Feuer Gallery, New York, NY. Special thanks to: The Andy Warhol Foundation for the Visual Arts, New York, NY; Anonymous; Susan E. Bower; Casa Magazine, Santa Barbara, CA; Carolyn Glasoe and Chris Bailey; The James Irvine Foundation, San Francisco, CA; Jensen Audio Visual, Santa Barbara, CA; Barry and Jill Kitnick; Montecito Journal, CA; Paseo Nuevo Shopping Center, Santa Barbara, CA; Santa Barbara Independent, CA; Santa Barbara News-Press, CA; Santa Barbara Sentinel, CA; Marc and Laurie Recordon; Georgene Vairo and Jenn Kennedy; and Wayne McCall & Associates, Santa Barbara, CA. Orlaineta’s work focuses on the minutiae of everyday life, thus transforming them into sculptural forms. Inspired by modernist design and its legacy, the artist combines hybrid forms where modernist ideals and contemporary realities collide. Orlaineta has written, “My investigations into modernist ideals praise both subject and form in modern art and design, as well as the contradictory ideologies that are forced upon the work due to a certain legacy within a larger historical/cultural context. Ultimately, I try to direct attention to the transformative powers of the everyday and its relentless aspiration for a utopian way of life.” Orlaineta will produce new work for MCA Santa Barbara’s Bloom Projects gallery in the summer of 2013. Special thanks to: The Andy Warhol Foundation for the Visual Arts, New York, NY; Susan E. Bower Exhibition Fund; Casa Magazine, Santa Barbara CA; Eric Chirnside, Santa Barbara, CA; The James Irvine Foundation, San Francisco, CA; Montecito Journal, CA; Paseo Nuevo Shopping Center, Santa Barbara, CA; Santa Barbara Independent, CA; Santa Barbara News-Press, CA; Santa Barbara Sentinel, CA; and Wayne McCall & Associates, Santa Barbara, CA.